Favorite Line: It's a funny saying, 'broaden your horizons.' I mean, there's just *the* horizon, which moves away from you, so you never actually catch up with it. You only get to where it's been... Or maybe it was the other way round; maybe you moved. You changed. Wow, two reviews from me in one week! How long has it been since that has happened? Too long to divulge, I think. Well, Terry Pratchett has that effect on me- his books are always entertaining. He is one of my absolute favorite authors, and this book will certainly hold a place of honor in my collection as it seems unlikely that Pratchett will be forthcoming with many more novels, as he has been diagnosed with early-onset Alzheimer's. Terry Pratchett is one of the few authors I have read whose female characters never seem to annoy me- unless they are created to be annoying. They always seem very real and practical, which is generally a good thing. In fact, the only reason none of his females are on my list of Females That Don't Annoy Me is because *all* of them would probably be on there, and that would make it a very long list. I received Nation as part of the Amazon Vine program for reviewing products. I am very happy to have received it. It is being marketed as a "young adult" novel, but I am not sure why as it is written in much the same way as his books that take place in Discworld (this one does not). Maybe because it's a "coming-of-age" story. Whether for young adults or old adults, though, it's thoroughly entertaining. Pratchett is in top form with his way of telling a good story while sharing an important Life's Lesson that everyone should learn. And doing it all in a way that makes you laugh out loud as you read. So beware of reading this book in cramped public transportation. You might snort, and people might look at you funny and then awkwardly shift away. Believe me. I know. Nation is about the clash of cultures- what happens when the civilized world meets the uncivilized world, and what might have happened, historically, if everyone had just decided to get along with each other. The situation isn't very original- it has been done by many authors before, and will probably be used many times again. 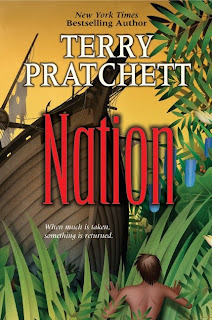 But of course it's Terry Pratchett, so the story comes to life with cussing parrots, ornery old grandmothers, the mysteries of milking a pig, an inappropriate song about making beer, and cannibals. I really love the way that Pratchett is so casual and light-hearted in his writing, but by the end of the book has made his very important point so eloquently that you might cry. I don't know how to do justice to a Pratchett plot or to his characters - the plot is good, and the characters are lovely. That's all I can really say without either giving everything away or not saying anything. I think any Pratchett fan will love this book, and I think anyone who likes satire and witty writing would love Terry Pratchett. If you haven't read him yet, you should. If you have read him, you should check out this book. Neither he nor the book will disappoint. I didn't even realise that there was a new Pratchett coming out. Thanks for the review! I requested this from Shelf Awareness and can't wait to read it! I was absolutely devastated when I learned that Terry Pratchett had been diagnosed with Alzheimer's. Great review! This sounds like a wonderful book. Hadn't heard anything about this book till now. Sounds good.